London’s travel zones dictate how much your journey will cost, but their radial nature forms an interesting geography for London in general. While zones actually only apply to stations and not the space between them (the official tube map distorts distance, and you won’t see an official geographical map with zones on it), you can squint at a map and approximate where each zone lies. 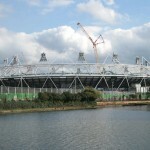 Zone 3 is the “hinterland” between inner London (Zones 1 & 2, or thereabouts) and outer London (roughly Zones 4-6). Zone 1 has an orbital tube line (the Circle Line) and Zone 2 has the circular part of the London Overground. I reckon there’s another circuit to be made – this time by bicycle. 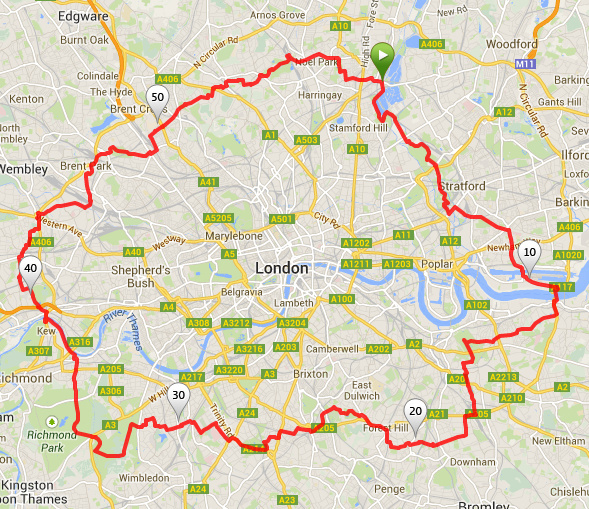 So, last weekend, I decided to do a complete circuit of London, staying entirely in Zone 3. Route as zoomable, downloadable map. It’s a 59 mile circuit, I chose to start and end it in the Lea Valley by Tottenham Hale, but there’s several other obvious points to start it from, including Kew Bridge which is where I broke the route over two days – the distance is certainly doable in a day, but cycling in London traffic for a sustained period is quite exhausting. It took around seven hours in total – I was going very slowly. Starting from Tottenham Hale, I headed down the canal towpath beside the River Lea, passing many moored canal boats (noticeably more than just a few years ago), the Lea Rowing Club and Springfield Marina. Crossing to the eastern side of the Lea Valley, is this extremely low bridge. The cycle path is good all the way down to Hackney Marshes, where the taller buildings in the newly opened Queen Elizabeth Olympic Park appear on the horizon. Not all the entrances to the park are quite open yet, including my intended entry by the Velodrome, but a short road section leads to the “lower” routes through the park, via new paths down at the riverside. The park is also a bit tricky to exit out of at the other end, with both the long-standing closure of a section of the Greenway, still in place. Then onto the Greenway proper, passing the impressively Victorian Abbey Mills Pumping Station. Then down to ExCeL, dodging the obstruction of the Crossrail building works, and onto the Connaught Bridge, squeezing past London City Airport. 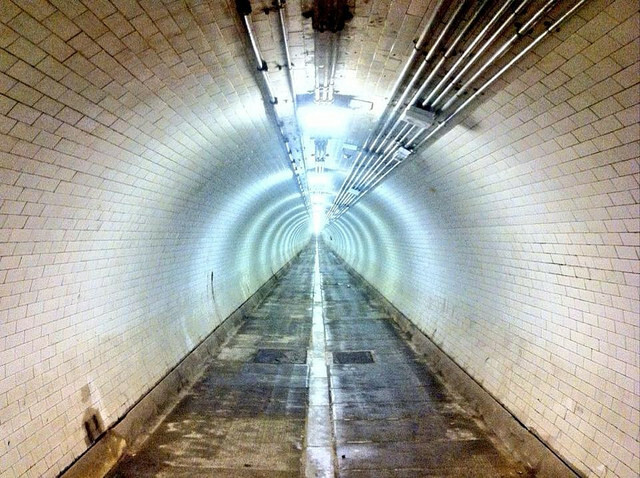 The first crossing of the Thames is via the Woolwich Foot Tunnel which is quite atmospheric – definitely the quieter, edgier version of its Greenwich cousin. I then followed (in reverse) the route of the first three miles of the London Marathon, via Charlton House, which I failed to notice during the run itself! The view from Greenwich Park is one of the most famous in London, but looking the other way is also striking, with a glimpse of the church at Blackheath. I was heading into south London sururbia now, trying to avoid the South Circular as much as possible, but this section was unexpectedly pleasant and interesting, despite being largely residential. A Zone 3 highlight is the Horniman Museum, its lovely Victorian conservatory currently closed but with another great view to London’s skyscrapers. South London’s Zone 3 has much green space including Dulwich Park, Tooting Common, Wimbledon Common with its windmill, and the eastern part of Richmond Park (which is huge), complete with deer, but also this rebuilt church and a rather old railway bridge, as well as this distinctive looking tube station. Then I was back to the bank of the River Thames at Mortlake. For the second day I started by redoing the Thames path section, it was more enjoyable this time as there were fewer swarms of flies! Crossing at Kew Bridge, my route through north London was, on the whole, less interesting, although I did pass this attractive pub (spot the animal on the roof) at Ealing, and it was good to see the odd bit of decent cycle infrastructure. 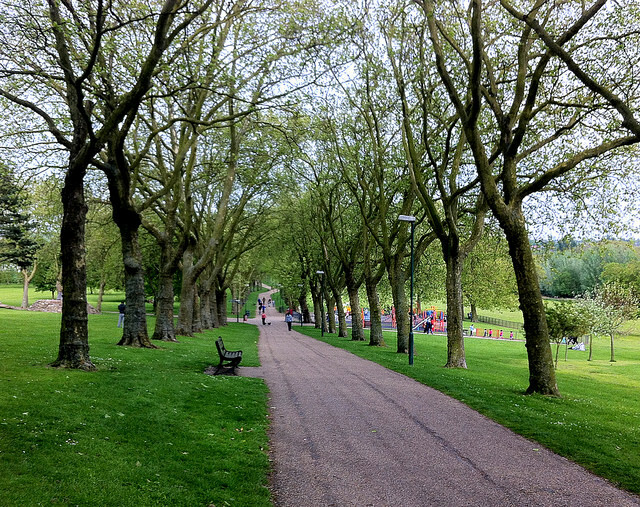 The parks here are smaller but Hanger Hill Park was a pleasant diversion – Hanger Lane Gyratory less so. Park Royal is a fading and grim part of town – note the poster on the right urging people to fill in the census (three years ago!) and the canal is unattractive here – and the towpath cramped. However, within the north-west London dullness (thanks for nothing, North Circular Road!) there is this dramatic building which I’d been meaning to visit for years. Gladstone Park in Dollis Hill (above) is very hilly, and lovely, but Hampstead Garden Surburb was an odd place, clogged with cars and not living up to its billing of being the most expensive and desirable place in the whole of Zone 3 (I would rather live in Lee or Hither Green if I had a choice!). Ally Pally is dramatic, as are the views, but it’s a shame that it is still little used, given its illustrious history. Broadwater Farm is also dramatic looking, in a very different way. The whole estate is built on stilts, because of the nearby brook. Finally, back to Tottenham and bit of history – here’s the town’s High Cross. Map of the photos – scroll right for the last few. Squinting at this map on Londonist, and this one, I deduced that I had managed to stay in Zone 3 all the way around. The Woolwich Foot Tunnel is nearly (but not quite) in Zone 4, Bellingham is also close, and the southern part of Wimbledon Common is definitely on the outer edge. 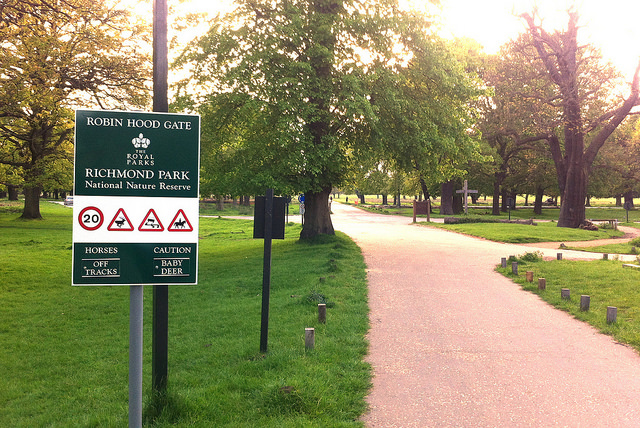 Richmond Park is an interesting one, going all the way from Zone 3 in the north and east, to Zone 4 in the west and Zone 6 in the south. So I stayed in the eastern part of the park. 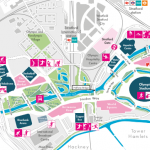 This is based on the Olympic Park canals, and parks of the Lea Valley – and Greenwich Park – being a lot more interesting places than the various tired looking parks in west London (Gunnersbury Park in particular) and the Grand Union Canal is pretty industrial in north-west London. South London is prettier as it isn’t spoilt by the nightmare that is the North Circular road, which acts to cut off outer North London from the inner part, in a way that the South Circular road doesn’t.